Why don't Chinese bystanders assist in medical emergencies? A frail women collapses at a train station but passers by do nothing. She lies there for almost an hour before emergency services arrive, by which time the woman has died. This was a real incident at Shenzhen railway station in February this year. Why do mainland Chinese people not act as Good Samaritans? asks Dr Dan Xiuli of the nearby Faculty of Medicine at the Chinese University Hong Kong, Shatin. 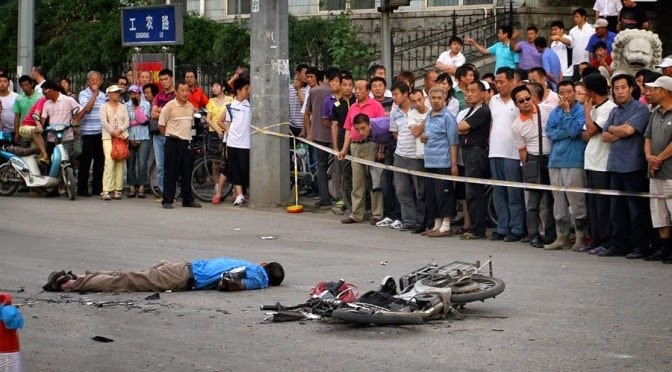 Writing in the Emergency Medical Journal this week, he asks, is it because would-be helpers in China have a fear of being wrongly blamed by victims as perpetrators and subject to demands for compensation? A recent survey found that only 14% of mainland Chinese would be willing to provide assistance to a stranger who needed medical assistance. And that reflects what happens in real life: most bystanders don't get involved, they hover and watch or they scuttle past without offering help. This reluctance to help has major implications for the 1.2 million Chinese who have accidents in public and require assistance each year, he says. Heart attacks, sudden illness in public, traffic accidents, natural disasters etc all require people who are willing to step forward and provide first aid skills. Is there any possibility of this happening in the People's Republic? Groups such as the Red Cross have suggested that a minimum of 30% of the population should have first aid skills training in order to be able to provide assistance in public emergencies. In developed countries such as Norway, more than 85% have skills in First Aid, whereas in the UK only 14% of people profess to have such skills. At the time of the Beijing Olympics in 2008 the Chinese government aimed to have more than 1% of people trained in first aid, but failed to reach this target. For most Chinese the only aid they are able to provide is notifying the 'relevant authorities' such as by dialling 120. Not surprising then, that studies have estimated that 87% of deaths from accidents in China are due to the lack of first aid. And shockingly, even staff entrusted with the care of the vulnerable, such as infants have no training or skills in first aid - fewer than 4% of kindergarten teachers could achieve even basic knowledge in first aid. Dr Dan concludes by saying that "First aid is not merely a skill but an act of humanity." He notes that China has a culture of many thousands of years, but most Chinese seem to have forgotten the traditional call to virtue of: ‘To rescue one person from death is better than to build a seven storeyed Buddha pagoda’ . Update: Some interesting research on Australian bystander reactions to medical emergencies from Flinders University.